For the Indian peak, see Meru Peak. For the Tanzanian mountain, see Mount Meru (Tanzania). Mount Meru (Sanskrit: मेरु, Tibetan: ཪི་རྒྱལ་པོ་རི་རབ་, Sumeru, Sineru or Mahameru) is the sacred five-peaked mountain of Hindu, Jain, and Buddhist cosmology and is considered to be the center of all the physical, metaphysical and spiritual universes. Meru to which is added the approbatory prefix su-, results in the meaning "Excellent Meru", "Wonderful Meru" or "Great Meru". In languages, (Tamil:"மகா மேரு பருவதம்"),(Chinese: 須彌山 Xūmíshān; Pāli Meru; Burmese: မြင်းမိုရ် Myinmo), Khmer:ភ្នំព្រះសុមេរុ (Phnom Preah So Meru). Many famous Hindu and similar Jain as well as Buddhist temples have been built as symbolic representations of this mountain. The "Sumeru Throne" 須彌座 xūmízuò style base is a common feature of Chinese pagodas. The highest point (the finial bud) on the pyatthat, a Burmese-style multi-tiered roof, represents Mount Meru. The dimensions attributed to Mount Meru, all references to it being as a part of the Cosmic Ocean, with several statements that say, "The Sun along with all the planets circle the mountain," make determining its location most difficult, according to most scholars. Some researchers identify Mount Meru or Sumeru with the Pamirs, northwest of Kashmir. The Suryasiddhanta mentions that Mt. Meru lies in 'the middle of the Earth' ("bhurva-madhya") in the land of the Jambunad (Jambudvip). Narpatijayacharyā, a ninth-century text, based on mostly unpublished texts of Yāmal Tantr, mentions "Sumeruḥ Prithvī-madhye shrūyate drishyate na tu" ('Su-meru is heard to be in the middle of the Earth, but is not seen there'). There exist several versions of cosmology in existing Hindu texts. In one of them, cosmologically, the Meru mountain was also described as being surrounded by Mandrachala Mountain to the east, Supasarva Mountain to the west, Kumuda Mountain to the north and Kailasha to the south. Mount Meru of Hindu traditions has clearly mythical aspects, being described as 84,000 Yojana high (about 1,082,000 km (672,000 mi), which would be 85 times the Earth's diameter, and notes that the Sun along with all the planets in the Solar System revolve around Mt. Meru as one unit. One yojana can be taken to mean about 11.5 km (9 miles) though its magnitude seems to differ over time periods, e.g. the Earth's circumference is 3,200 yojanas according to Vārāhamihira and slightly less so in the Āryabhatiya, but is said to be 5,026.5 yojanas in the Suryasiddhānta. The Matsya Purana and the Bhāgvata Purāna along with some other Hindu texts consistently give the height of 84,000 yojanas to Mount Meru which translates into 672,000 miles or 1,082,000 kilometers. Mount Meru was said to be the residence of King Padamja Brahma in antiquity. 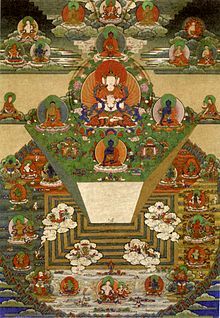 According to Jain cosmology, Mount Meru (or Sumeru) is at the centre of the world surrounded by Jambūdvīpa, in form of a circle forming a diameter of 100,000 yojans. There are two sets of sun, moon and stars revolving around Mount Meru; while one set works, the other set rests behind Mount Meru. This mythical mountain of gods was mentioned in Tantu Pagelaran, an Old Javanese manuscript written in the Kawi language from the 15th century Majapahit period. The manuscript describes the mythical origin of Java island, and the legend of the movement of portions of Mount Meru to Java. The manuscript explained that Batara Guru (Shiva) ordered the god Brahma and Vishnu to fill the Java island with human beings. However at that time Java island was floating freely on the ocean, always tumbling and shaking. To stop the island's movement, the gods decided to nail it to the Earth by moving the part of Mahameru in Jambudvipa (India) and attaching it to Java. The resulting mountain is Mount Semeru, the tallest mountain on Java. ^ Sachau, Edward C. (2001). Alberuni's India. Psychology Press. p. 271. ISBN 978-0-415-24497-8. ^ "The Devi Bhagavatam: The Eighth Book: Chapter 15". Sacred-texts.com. Retrieved 2 March 2012. ^ Chapman, Graham P. (2003). The Geopolitics of South Asia: From Early Empires to the Nuclear Age. p. 16. ^ Cort 2010, p. 90. Cort, John (2010) , Framing the Jina: Narratives of Icons and Idols in Jain History, Oxford University Press, ISBN 978-0-19-538502-1 . Narpatijayacharyā, commentary by Ganeshdatta Pathak, Published by Chowkhambha Sanskrit Sansthana, Varanasi, India, PIN-221001. 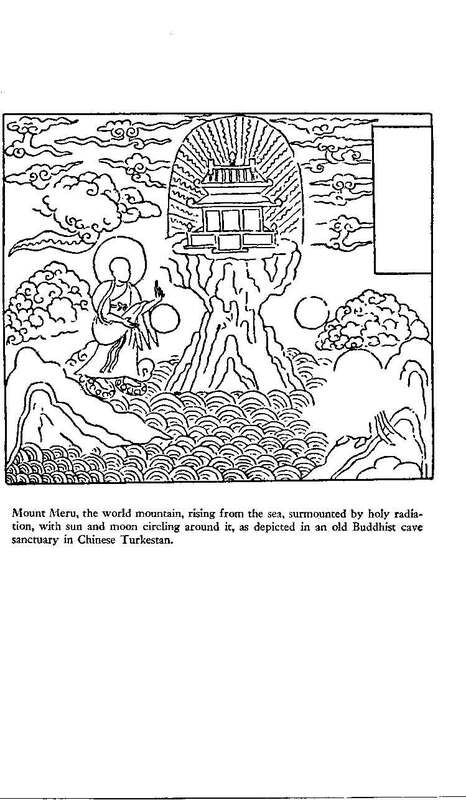 Wikimedia Commons has media related to Mount Meru (mythology).